They’re vibrant, wild, and colorful. But much more than cool pictures, the art hanging outside of the Lister Hill auditorium at NLM shows life itself in views that most people never get to see. 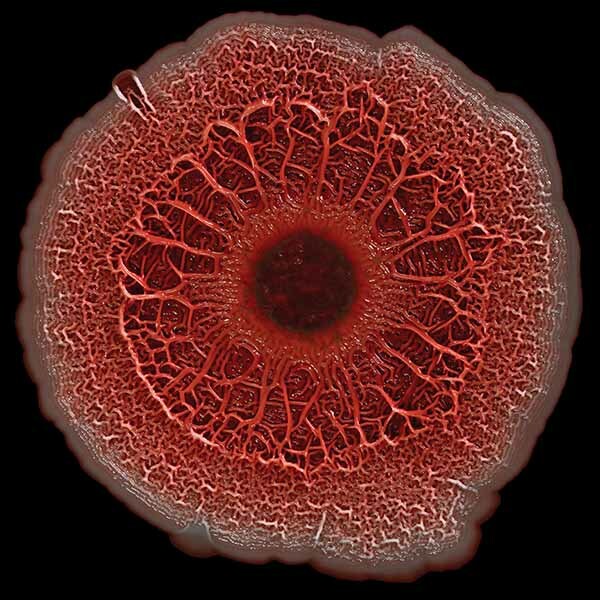 Winning images from the BioArt competition express the beauty and breadth of biological research. The art is on display at the NLM Lister Hill Center. It’s called BioArt. Look closely and then read the captions. 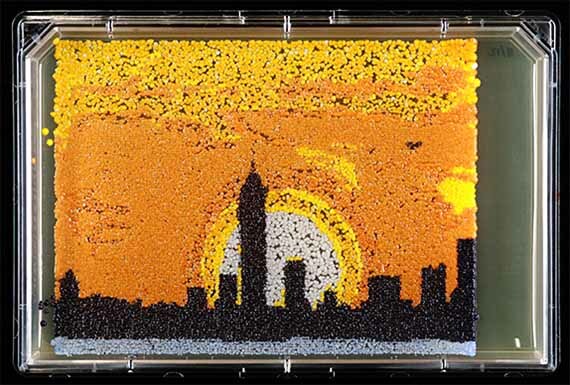 The skyline of New York City was created by “printing” nanodroplets containing yeast. A lacelike red circle is an image of a microbial community. 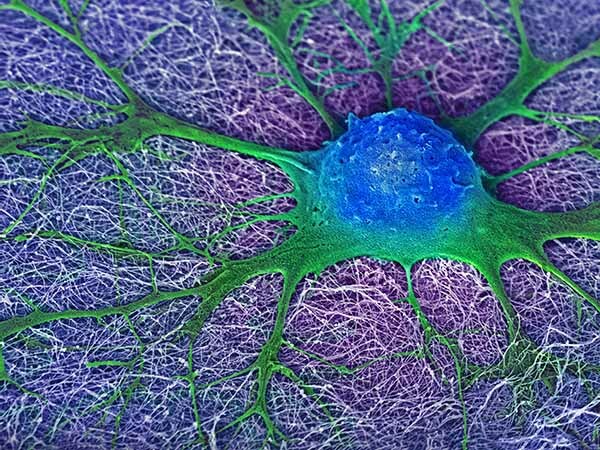 And what looks like it could be a blue and green sea creature with tentacles is a picture of the nerve cell of a mouse. BioArt depicts images of live tissues, bacteria, living organisms, and life processes, which are produced in laboratories, galleries, or artists’ studios. The artwork is created using scientific processes such as biotechnology, including genetic engineering, tissue culture, and cloning. 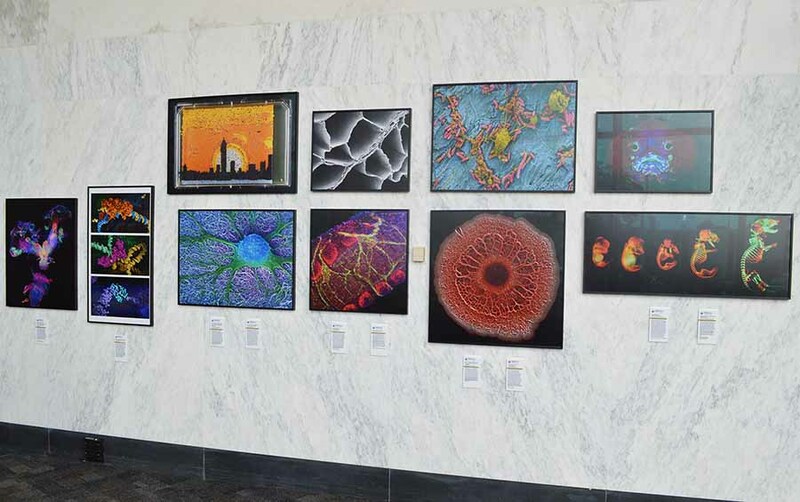 The newly installed art shows winning images from the 2016 Federation of American Societies for Experimental Biology (FASEB) BioArt Scientific Image Competition. Most of the 10 winners, whose artwork hangs at NLM, received support from NIH. “We wanted to share the beauty and breadth of biological research with the public,” said Tara Mowery, director of NLM tours, who coordinated with FASEB to have the images on loan to NLM. The exhibit is already attracting quite a bit of attention, particularly from NLM staff. “I would hang these in my house,” said Sandeep Nair, operations coordinator to the director of NLM. Stop by in person at the Lister Hill Center (Bldg 38A) or visit FASEB. The BioArt will be on display at NLM through the end of 2017. August 25, 2017 in Exhibitions.